The Hungering Deep, the first major content patch for Sea of Thieves, launched today. The bulk of the content involves sailing the length and breadth of the map, solving some mostly straightforward riddles, in order to unlock some of the new cosmetic items included in the new content: a Speaking Trumpet, a Drum, and a Shark Tattoo. After going through it today, I decided to throw together a little walkthrough, as some of the riddles are a little tricky or involve easily missed items you must interact with. Without further ado, here we go. 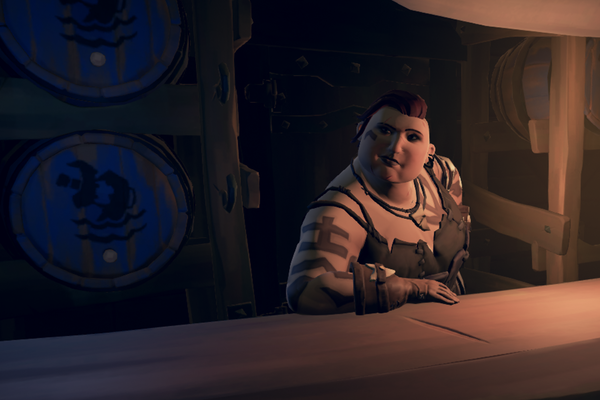 The whole thing starts by talking to a new NPC who appears in all the Outposts in the Sea of Thieves. 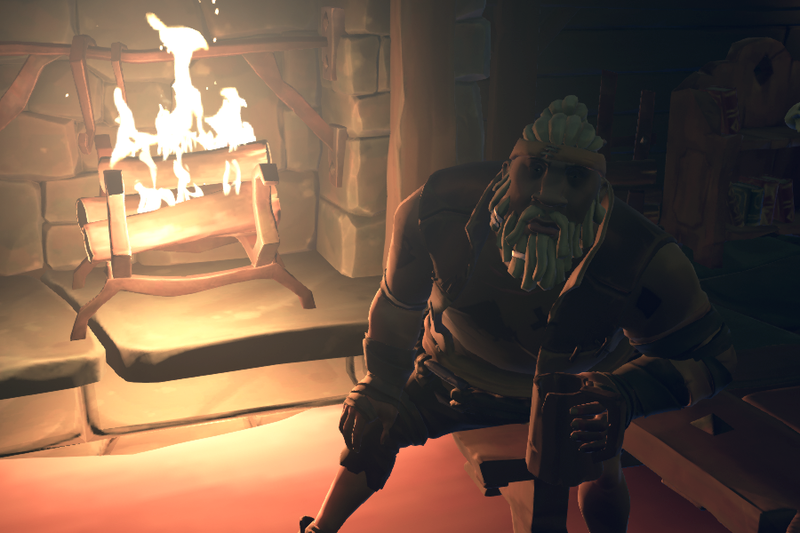 He is a representative of a new faction called The Bilge Rats, and he will direct you to speak with “Merry” Merrick. 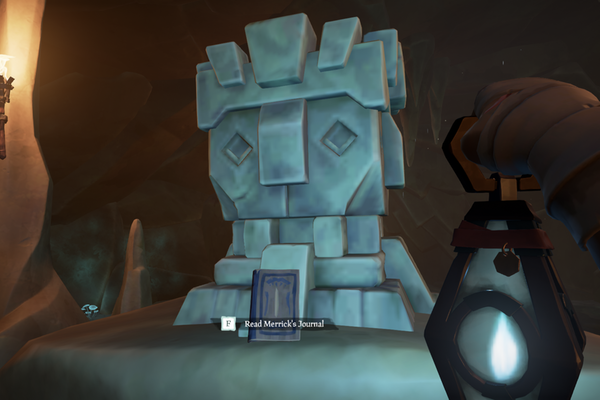 He’ll tell you Merrick can be found on the south western shore of Shark Bait Cove, and this is exactly right. 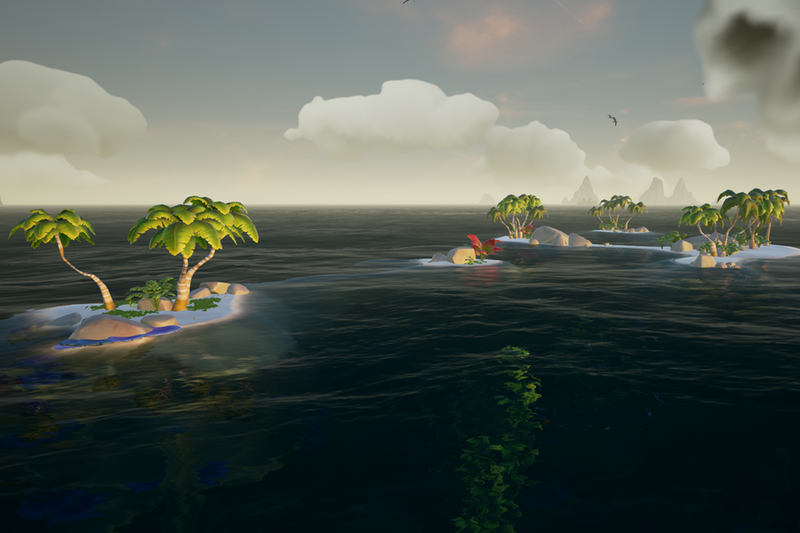 Once you arrive at Shark Bait Cove and make your way to the south western most island in the outer ring of the archipelago, drop anchor, hop out, and talk to Merrick. Be prepared to fight skeletons that seem to spawn frequently around him. You probably don’t have to worry too much about any other Pirates there; most people seem to be approaching this event rather peacefully. Your mileage, of course, may vary. However it ends up, Merrick will give you a Speaking Trumpet, yours to keep, and eventually direct you to read his journal. Merrick’s journal can be found on a shark shaped altar in the center of Shark Bait Cove. You’re going to want to head over to Golden Sands Outpost. 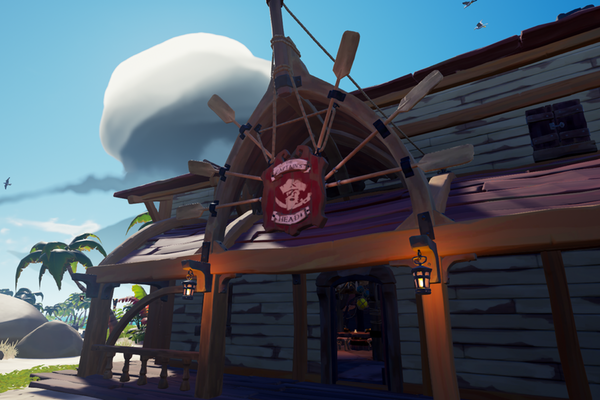 And head into The Captains Head tavern. 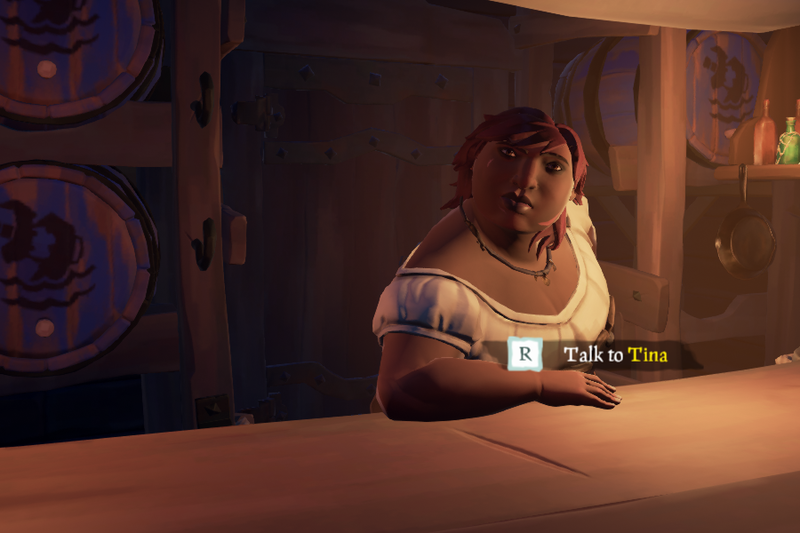 Inside, you’ll want to talk to Tina. 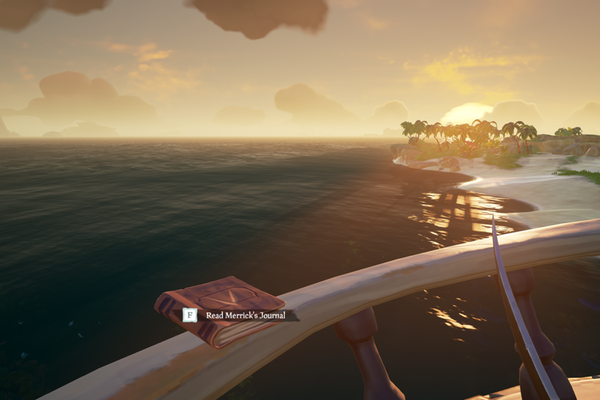 She will tell you a story, mentioning that Merrick’s ship was called the Killer Whale, and was wrecked on an uncharted island north of, “Idiot Island,” and east of, “Double Trees.” I’ve marked a spot north of Fools Lagoon and east of Twin Groves on the map at the end of this article. It shows the course for the entire voyage. The island you’re looking for looks like this; Tina mentioned that the crows nest of the Killer Whale was still sticking out of the water. 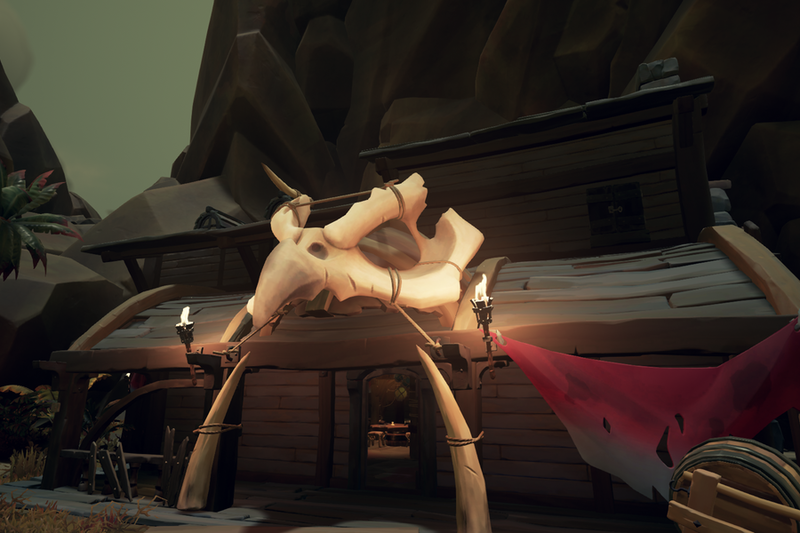 You’ll want to make your way over to Dagger Tooth Outpost. Enter the unnamed tavern there. And talk to Teri. She’ll tell you all about a date she had with Merrick, on an uncharted island, in a “fishy cave … under a golden arch.” This island is also marked on the map below. Make your way there. It looks like this and can be easy to miss, so keep a weather eye. 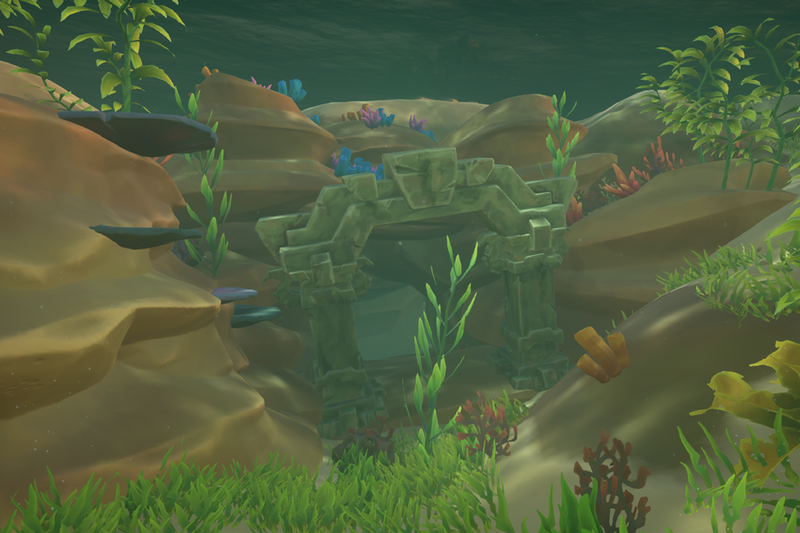 The arch Teri spoke of is more green than gold, and lies underwater near the middle of the tiny archipelago. Swim under it. Take a deep breath first as it’s a bit of a swim. Eventually you’ll surface in an underwater cave. There is an idol up on a platform. 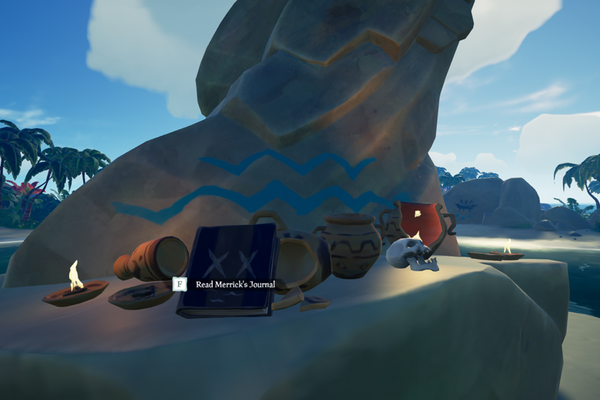 Climb out of the water to find Merrick’s final journal. In it, Merrick will mention an, “Infernal Ridge.” If you’ve been paying attention you should also have figured out his favorite letter is T. Near column T on the map, is Devil’s Ridge. Remember that. At this point you’ll be directed to return to Merrick on Shark Bait Cove. Merrick will say he mentioned the spot, where he fought the beast, in his journals. He’ll also warn you to not stray into the shroud. This can only mean the spot where the beast is is on the very edge of the map. Given his favorite letter, this can only be grid square T26. I’ve also marked this spot on the map below. 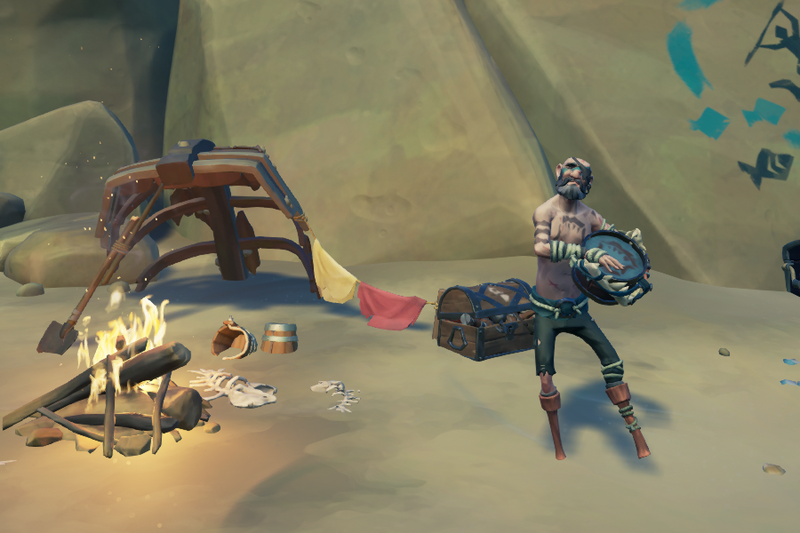 Merrick will now give you the Drum and a Shark Tattoo. You’ll also notice he’s playing a new Shanty. You don’t actually learn this shanty, but you do have to play it, along with 4 other Pirates (for a total of 5), to summon the beast. This means you’ll be required to team up with at least one other crew. 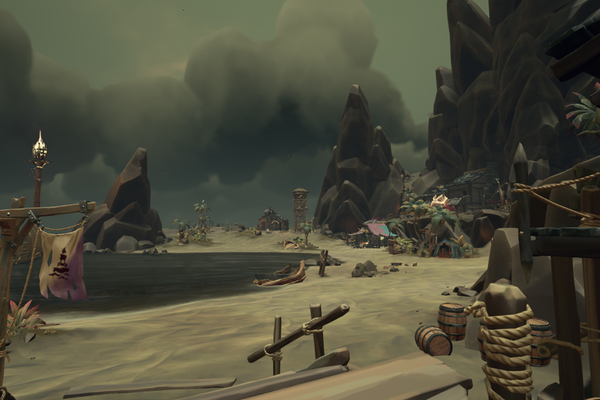 A lot of Pirates seem to be congregating near Merrick to do just that. It also means, since you don’t know the shanty, you’ll have to “carry” it from Merrick to the spot near Devil’s Ridge. 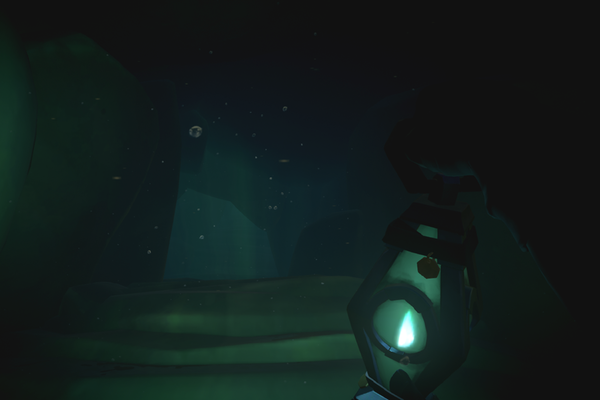 Pull out an instrument and start playing along with Merrick, then keep playing it as you sail to the summoning spot. You’ll probably need one of your new friends to pick it up from you as you board your ship. Tricky business, summoning beasts. The actual summoning spot, as mentioned above, is T26. 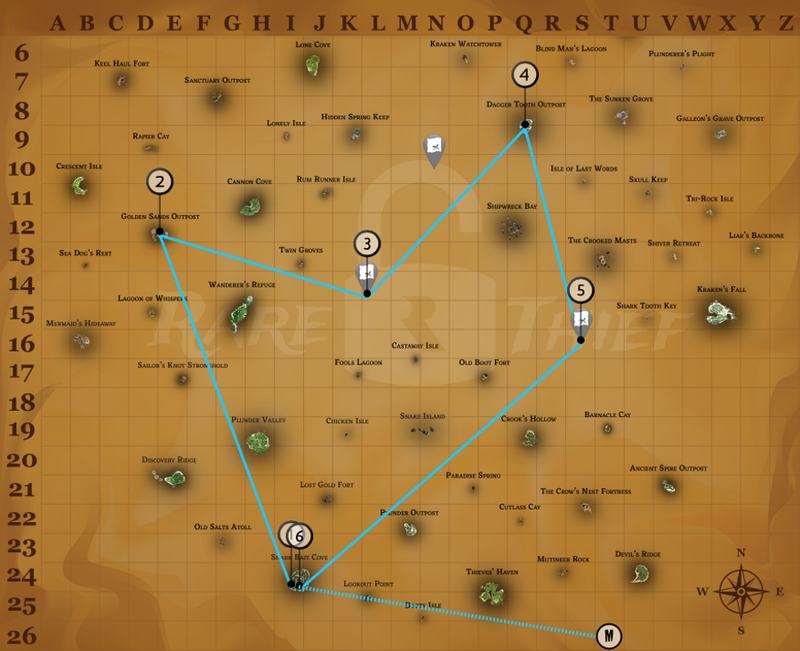 I’ve marked it with an M. I hope this guide has helped you get your new vanity items, and led you to a fun interaction with other Pirates and a legendary beast. Have fun fighting the beast! 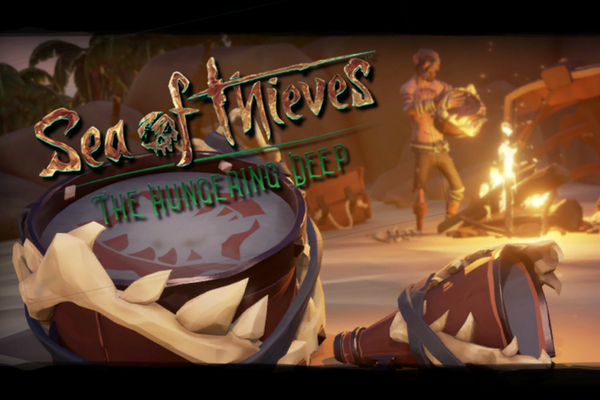 [EDIT June 4th, 2018] Here are some tips for getting into a group to summon and defeat The Hungering One. If you just want to try and find a group in-game, I advise you to check both the spawn/summoning area at T26 and the spot Merrick hangs out, on Shark Bait Cove, at I24. A lot of crews hang out at both places looking for pirates to team up with. 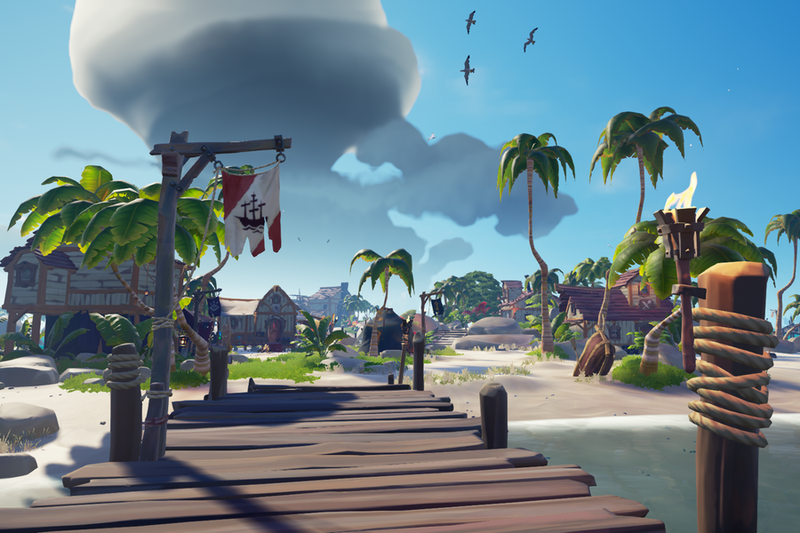 If you log into an Outpost on the east side of the map, sail to T26 and check, and then on to I24 if no one is there; do the opposite if you log in on the west side of the map. 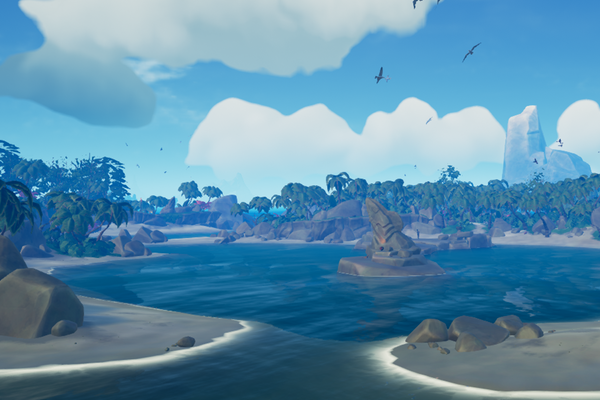 Your other option is to check the official Sea of Thieves Discord. 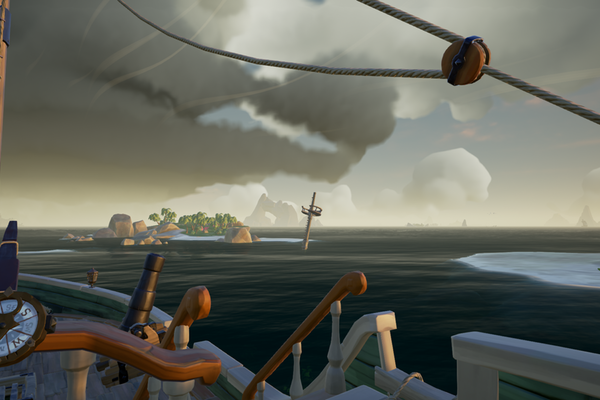 That’s where I found a crew to take down The Hungering One. Good luck!